Very simple dialogue tool: go around the room and do a “check-in” asking people what they are thinking/feeling. There seems to be a lot of power and need for simply talking and sharing stories with one another. 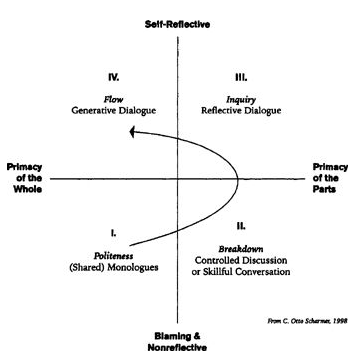 Dialogue channels energy towards a center and away from polarization. High quality leaders are trending away from agenda laden meetings in favor of free space to dialogue. Part of the purpose of this book is to create a vocabulary to have a meta-conversation about dialogue. At 652, an outline of the book is provided. If one can choose suspension over defense, you can inter reflective dialogue, which in turn gives way to generative dialogue – an inventive conversation. Chapter’s goal is to set forth a “theory” of conversation. We need a “beginner’s mind” as the mystics speak of, not an expert’s mind. 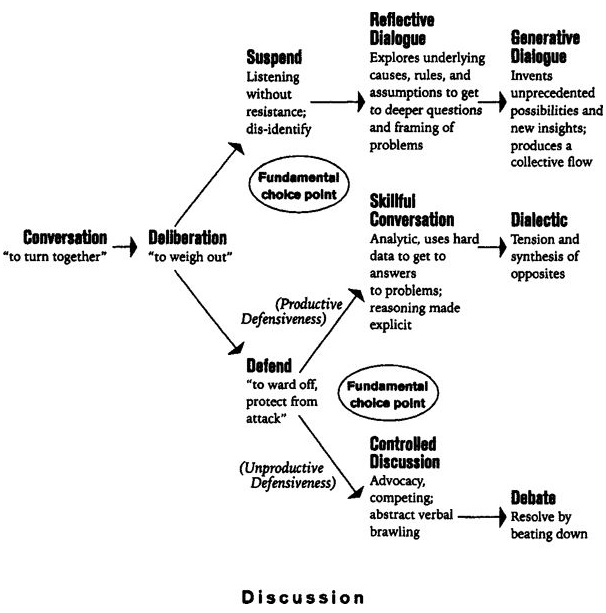 Without practical knowledge of dialogue theory, we don’t have much of a road map. But ultimately, there is no “technical” solution, no step, by step process. But rather good dialogue is about being. It is intuitive and must be mastered. It is already within us and must be learned inductively. Dialogue begins with self. Next four chapters will describe “practices” that are intended to be lifelong and community based to help me develop the “four practices of dialogue” (see chapter 1 notes). Hearing is deeper than the other senses, particularly sight. The speed of sound is slower that the speed of light. There are few illusions in hearing. Sound is always deeply connected to its environment. Also, it contains meaning within it to be unfolded in future contexts. Dialogue allows us to hear a fuller context. The written word has disconnected our auditory experience from nature. Most of our “listening” comes from a predisposition we carry into a conversation and thus isn’t listening at all. We must distinguish between the inferences we make about experience and the experience itself. There can be a difference between a valid judgment and an observable fact. Someone arriving late can be a valid judgment, but not an observable fact. “Listening from disturbance” is the term that describes hearing data from memory rather than the present moment. Listening from disturbance is usually self-confirming. To make progress, “follow the disturbance” (the source of difficulty). Then, look for data that disconfirms your point of view. People tend not to say what they really think because they perceive themselves to be in a lose-lose situation. Dialogue can open up when we listen for the dilemma and bring it to light. We have to see genuine value in others we’re dialogging with. Treat the people you come in contact with as a teacher. The observer and the observed cannot be separated. Finding one’s center is key to genuine respect in dialogue. Look for what is strange in the other – what you have no category for, spend time with this sort of person. Don’t react to the tension that arises in dialogue. Retain respect for all positions in a dialogue. Be aware of the parts of yourself that do not respect others. By holding and examining our internal criticism – neither disavowing nor expressing it. Thoughts do not just appear. Suspension gives us access to How criticisms emerge. Instead of just trying to fix, ask how conditions arose that calls the problem in the first place. Our speaking should not come from a predetermined statement formed in reaction or immune to context, but rather emerge unplanned and almost burst forth from us for the sake of the group. Our voices should “unfold and enfold.” They should be our unique ‘music’ to contribute to the world. To let a group’s voice emerge, allow a few moments after someone has spoken to pass so that the meaning can bloom. Voices can have a dark, overinflated side, that crowds others out. It ultimately undermines their credibility and effectiveness. Predictive intuition is the ability to see the forces operative that are guiding the dialogue. 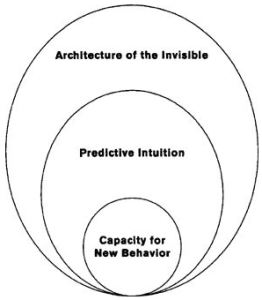 Two dimensions of predictive intuition: (1) seeing the gaps between what people do and what they intend and (2) anticipating and overcoming hidden and powerful structures that neutralize dialogue. This chapter explores the first dimension of predictive intuition – the gap between what is done and what is intended. Advocacy is speaking from a point of view. Inquiry is exploring what you don’t yet understand. Inquiry can disarm advocacy. Advocacy must be balanced with inquiry and we should err on the side of inquiry. 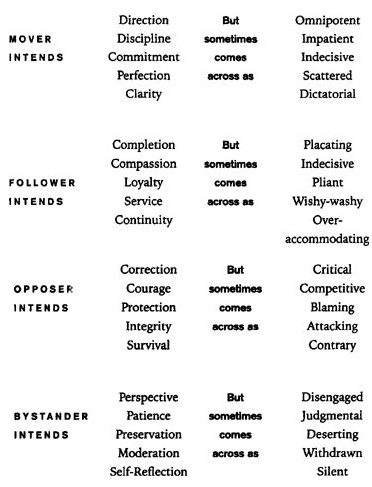 A healthy conversation, according to Kantor involves a (1) mover, (2) follower, (3) opposer, and (4) bystander (2749). All people feel free to occupy any of these positions at any time. There is such a thing as a “mixed move” – a statement/action that is more than one of the 4 positions. People tend to be better at one or another of the positions. We can also get “stuck” in one of the positions. Listen for the position a person is using. Listen for the underlying intention behind that position. Below are some common ones. The central spirit behind this approach is forgiveness. This chapter is about recognizing and overcoming the hidden and powerful things that often neutralize dialogue. It can be very difficult to communicate across these “languages.” You should first understand your own primary language. Random “system paradigms” – individuals without any clear correlation. System, what system? Mapping – I’m not very clear on how to do this. Seems like putting on paper both issues and structures as well as the content of what is said are important. There are “conversational fields,” which are all of the influences – memories, atmosphere, energy, etc. exerting influence in a conversation. Fields are somewhat like stages in a conversation. The route to understanding goes through doubt and confusion. “Fields” cannot be manufactured, but the “container” can be intentionally set. A well prepared container sets you up for the best field possible. The idea behind a container is that human beings need a setting in which to hold the intensities of their lives. Ensure, before dialogue begins, that energy, possibility, and safety are present. All spaces have their role. It is movement through the fields that indicates health. Initially the container supports very little intensity. Things are kept polite and superficial. Differences are kept hidden. Erving Goffman is an expert in Field 1 behavior. We must encounter the “crisis of emptiness.” Here, we empty ourselves of expectations that anything new is to happen. We empty ourselves when we realize our initial desires aren’t going to be met. This crisis can be provoked by commenting on the process of the conversation itself. On the other end of this crisis there must be a move towards shared responsibility. Here silence is socially awkward. Kronos dominates. Here people start to say what they think. Move – oppose sequences emerge. Here silence holds tension. Kronos time is running out. Curiosity dominates the Inquiry Field. No longer are people feeling compelled to agree. They reflect upon the rules themselves. “Outsight” is insight collectively experienced. Here we must engage the “crisis of fragmentation,” where we can be something new together. Here silence silence is thoughtful, reflective. Here we start to become aware of kairotic time. The rarest of all, in this stage people come to an awareness of the whole. There is an experience of “flow” or “collective flow.” People can speak from and interact in a pool of common meaning. Here we must overcome the “crisis of entry (or reentry)” as we come out of the generative state into a world more familiar with Field 1 and 2. The movement of healthy dialogue requires us to continue beyond the generative stage into other places. In this way, the movement is more like a spiral or a circle. Here silence is whole, even sacred. Kairotic time dominates here. Kronos is time measured. Kairos is time that is filled with its own purpose. Kronos is external time, Kairos is internal time. 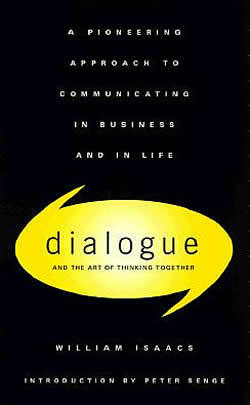 This chapter is about the best leadership practices for each field of dialogue. Clarify your intentions – do you see them as “needing help”? If so, can you tell them? Embody service – what is our group’s highest purpose? unique calling? Seek paths to resolution – what actions are now possible? Our thoughts are not merely “in here,” but rather connected with our feelings, bodies, and perceptions of the outside world. When we think of something we like, we feel good – these are interwoven. Language tends to separate all of this. This chapter uses ecology as an analogy for what is happening to us internally. One limit is the factor of interpretation, which science leaves little room for. We each carry our own ecology – one that surrounds us and one that is internal. They also affect one another. This applies to groups as well. Ecologies are made up of reflexive memories. These happen instinctively. To transform our ecology, we must transform our memories. We do this through perceptions inherent in the practices of dialogue. Changing the way we talk can change the way we think. Three great value spheres of human experience: (1) the Good (We), (2) the True (It), and (3) the Beautiful (I). These exist more independently and don’t naturally talk easily to one another, but they should be seen as interconnected. In our scientific era, the True (It) has dominated the Good and the Beautiful. According to Plato, the Good should be the master of the other two. We are in a period of “punctuated equilibrium” – a massive change, reordering things. An adjustment to this change can’t only be personal, but must be collective. Networks can be the solution to many intractable problems. We must learn to manage our ignorance. There are three different types of ignorance: (1) blindness, (2) unawareness, and (3) deliberately withheld information. This chapter deals with real world examples of some of this theory in action. Very case-studyish. I listened to most of this chapter via “Speed Up.” It deals with the real world politics of all of this theory. Less “how to” than the rest of the book, but reflects on the most polarized of all places – the American political scene. Not terribly important to review. I listened/read this chapter via “Speed Up” as well. It seemed to be a sort of reflection on the theory emphasizing how it ties together everything “wholistically.” Each of the elements in the Good, Beautiful, and True. The content and the feeling. It reflects on the Internet both good and bad for dialogue. Also not so much how-to, but probably the most useful chapter in Part V.
The book seems to be aimed at those facilitating meetings. How can this all be applied when we’re participants and have more limited ability to set the container and so forth? How does one map the structures of dialogue? How do time constraints effect dialogue? How can dialogue be successful when a “figurehead” is dialoguing for a group? How can they internalize the change inherent in being part of the conversation.